Joining I-30 with I-40, Interstate 430 provides a both a western bypass of Little Rock and a commuter route. The I-430 bridge across the Arkansas River is the lone crossing of the waterway between Downtown Little Rock and Conway, some 25 miles to the northwest. 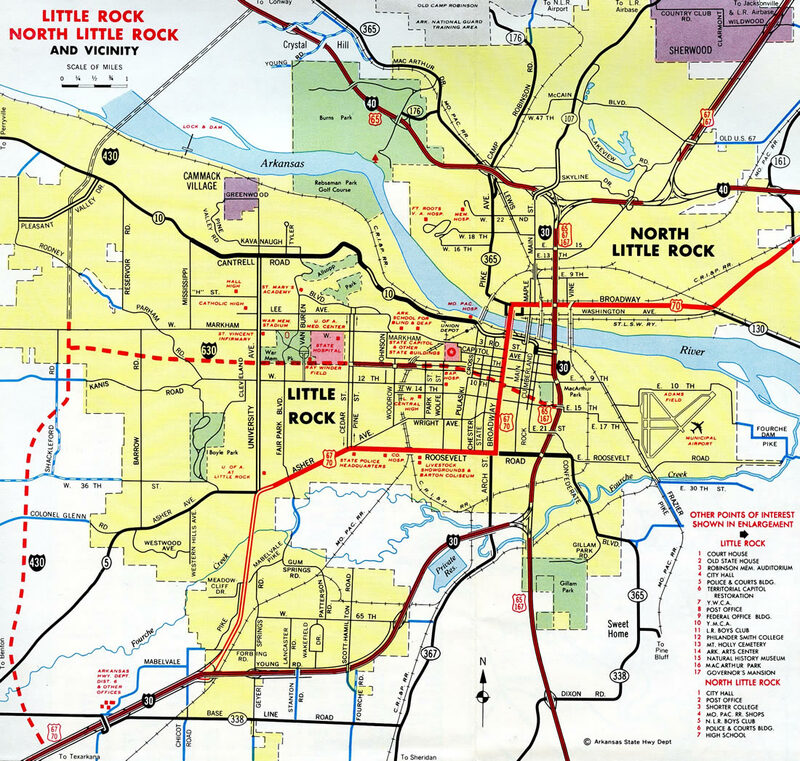 Early plans for both Interstate 430 and I-630 in western Little Rock originated in the mid-1950s. During that time period, University Avenue represented the western extent of the built up area of the capital city. Interstate 430 was constructed initially from Markham Street in west Little Rock to I-40 near Crystal Hill. The route was completed in 1975 at a total cost of $67 million. No control point was used on older guide signs for I-430 on Interstate 40. These overheads were recorded on video May 30, 1995. Interstate 430 was under construction from I-40 southwest to Marham Street. I-630 was only open at this time between the couplet of Cedar and Pine Streets and the State Capitol at Park Street. Crossing Murray Lake along the Arkansas River, Interstate 430 converges with Arkansas 100 at a diamond interchange (Exit 12) preceding I-40 in North Little Rock. Photo taken 05/20/14. Six lane expansion underway in 2014-16 along I-40 west from Interstate 430 to Highway 365 at Maumelle included adding a third northbound to Exit 13B. Photo taken 05/20/14. Exit 13B separates with two lanes from the north end of I-430 to Interstate 40 west 21 miles to Conway. Exit 13A joins a c/d roadway along I-40 east ahead of Highway 100 in North Little Rock. Photo taken 05/20/14. Interstate 40 passes by an abandoned rest area at Padgett Mountain, 1.25 miles ahead of the directional T interchange (Exit 147) with I-430 south. Photo taken 05/07/12. 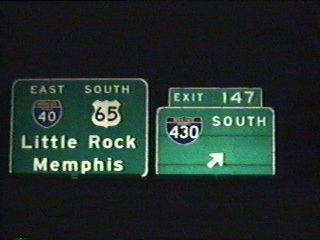 Entering the city of North Little Rock, Exit 147 departs from I-40 east & U.S. 65 south at the Norman Road overpass for Interstate 430 south to west Little Rock and I-30 to Texarkana. Photo taken 05/07/12. Interstate 40 west & U.S. 65 north navigate a pair of S-curves through Burns Park to Arkansas 100 (Crystal Hill Road) at Crystal Hill. I-430 follows in one mile. PPhoto taken 05/07/12. Exit 148 departs I-40 west & U.S. 65 north for Highway 100 (Crystal Hill Road). A lane drop occurs at the succeeding slip ramp (Exit 147) for I-430. Highway 100 originates at Exit 148 and loops northwest through Maumelle. Photo taken 05/07/12. The entrance ramp from Highway 100 forms a collector distributor roadway to the directional T interchange (Exit 147) with Interstate 430 south. Photo taken by Eric Stuve (12/19/02). 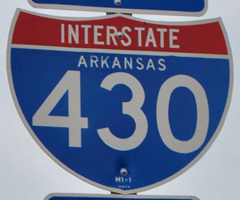 Guide signs for I-430 were replaced in 2016 and show Texarkana for the connection with I-30 west. Photo taken 05/07/12. The c/d roadway at Exit 147 partitions for I-40 west to Conway and Fort Smith and I-430 south into west Little Rock. Photo taken 05/07/12. Southbound Interstate 430 meets Arkansas 5 (Stagecoach Road) at a diamond interchange (Exit 1) along the eastern foothills of Ellis Mountain. Three lanes press southward 1.25 miles to Interstate 30. Photo taken 05/07/12. Interstate 430 previously reduced to two southbound lanes beyond Fourche Creek. Exit 128 to the north side frontage road for I-30 opened along this stretch in December 2014. Photo taken 05/07/12. Interstate 430 concludes at a trumpet interchange (Exit 129) with I-30 west to Texarkana and east toward Downtown Little Rock. Construction in 2016 widened Exit 129B to two lanes. Photo taken 05/07/12. Two miles southwest of Interstate 430 (Exit 129) on I-30 eastbound. The ensuing interchange connects with Mabelvale West and Otter Creek Roads. Photo taken 05/20/14. A frontage road system accompanies Interstate 30 east from Exit 116 at Benton to 65th Street (Exit 135) in LIttle Rock. The four roadways pass under Vinny Ridge Road one mile out from Interstate 430 north. Photo taken 05/20/14. A slip ramp (Exit 128) links with the I-30 frontage road ahead of Mabelvale West Road and the Outets of Little Rock retail center located west of I-430. Photo taken 05/20/14. 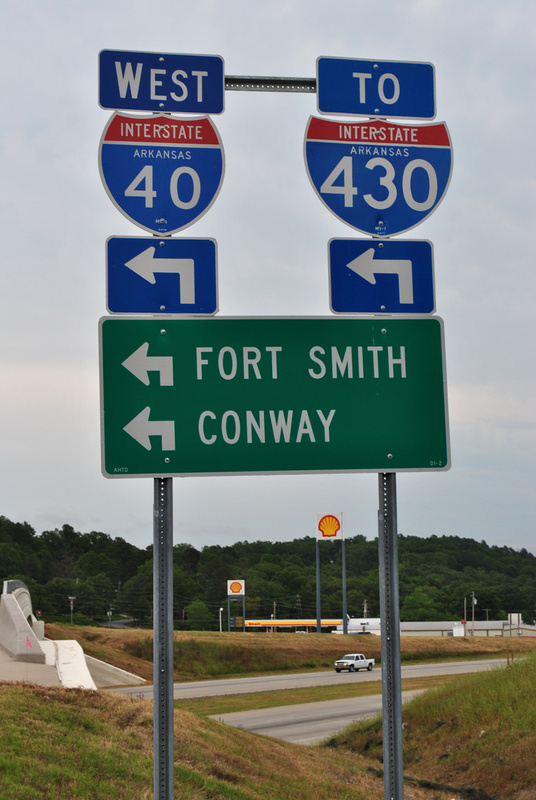 Interstate 430 provides a bypass of Little Rock north to I-40 northwest to Conway, Russellville and Fort Smith. Photo taken 05/20/14. Entering the trumpet interchange (Exit 129) with I-30-U.S. 70 east and U.S. 67 north. Photo taken 05/20/14. Exit 131 departs from I-30 & U.S. 67-70 westbound to McDaniel Drive 2.25 miles ahead of Interstate 430 north. Photo taken 05/20/14. All guide signs for Interstate 430 along I-30 from the Mabelvale Pike overpass westward were replaced during construction to relocate Exit 128 to Otter Creek. The new westbound off-ramp at Exit 128 opened to motorists on December 17, 2014.4 Photo taken 05/20/14. Exit 128 constitutes a slip ramp to the north side frontage road a half mile east of Interstate 430. Photo taken 05/20/14. Exit 129 parts ways with I-30 & U.S. 67-70 west for Interstate 430 through west Little Rock to North Little Rock. Photo taken 05/20/14. “New I-30 Exit Ramp Opening in LR’s Otter Creek.” Fox16 (Little Rock, AR), December 17, 2014. “I-430 interchange widening complete, I-630 widening now on the horizon.” KATV (Little Rock, AR), November 16, 2016. I-40: Pulaski County – Connecting Arkansas Program. – Arkansas Department of Transportation (ArDOT), web page.